Baritone Christopher Clayton is quickly establishing himself as a rising talent on the operatic stage. He has appeared with companies such as Utah Opera, Portland Opera, Sacramento Opera, Chautauqua Opera, Skylight Opera, and Stockton Opera. Recent engagements have included Alvaro in Florencia en el Amazonas, and Fredrich Bhaer in Adamo’s Little Women with Utah Opera; Falke in Die Fledermaus with Opera Theatre of the Rockies; Marcello in La bohème with Opera Idaho; and Polydorus in Berlioz’s L’enfance du Christ with the Utah Symphony. Current engagements include Count Danilo in The Merry Widow with the Imperial Symphony Orchestra and Tonio in Pagliacci with Opera Birmingham. Mr. Clayton is a versatile singer praised for his “golden baritone” and “dynamic” stage presence. He has had success in musical styles varying from the title role in Monteverdi’s Il ritorno d’Ulisse in Patria to Sharpless in Madama Butterfly to Mr. Gedge in Britten’s Albert Herring. He has appeared in Madama Butterfly with Utah Opera, Chautauqua Opera, and Stockton Opera; in La bohème with Sacramento Opera and Skylight Opera; in Il ritorno d’Ulisse in patria, Albert Herring, Carmen, Die Zauberflöte, and Faust with Portland Opera; and in Gianni Schicchi with Chautauqua Opera. He has covered Escamillo in Carmen, Dandini in La cenerentola, Gianni Schicchi, the Count in Le nozze di Figaro, Papageno in Die Zauberflöte, and the Doctor in Vanessa. An early love of classical music and a fascination with German Lieder led to Christopher’s desire to become a professional singer. That interest continues, and he enjoys being an active recitalist and concert singer. 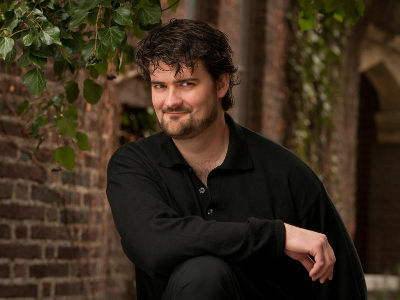 Most recently he has appeared as a soloist in Bernstein’s Mass and in Händel’s Messiah with the Utah Symphony, and as the soloist in Cimarosa’s Il maestro di cappella with the Walla Walla Symphony. Mr. Clayton was a Portland Opera Studio Artist and returned to Portland Opera in 2010 for Trouble in Tahiti. He was a young artist with the Chautauqua Opera in both the apprentice and studio programs and received a Professional Studies Certificate and master’s degree from Manhattan School of Music. At Manhattan School he studied with Maitland Peters and worked closely with Warren Jones and Dona Vaughn. Prior to his studies in New York, he received bachelor’s degrees in vocal performance and mechanical engineering from the University of Utah. He has received prizes and grants from the Gerda Lissner Foundation, the Violetta Pollara DuPont Vocal Competition, the Marian Anderson Vocal Competition, the Irene Dalis Vocal Competition, the Chautauqua Opera Guild and the Oratorio Society of New York.